Two new lawsuits have been filed against the City of Los Angeles and one has been filed against the City of West Hollywood over the controversial 8150 Sunset Blvd. project. As was previously reported, the Los Angeles Conservancy filed a lawsuit in L.A. Superior Court on Thursday arguing that the City of Los Angeles did not comply with the California Environmental Quality Act (CEQA) in its review of the 8150 Sunset project. But also on that date a group called “Fix the City” sued the City of Los Angeles, making a similar argument and asking that a judge order the city to reverse its approval of the project. Fix the City is an advocacy group organized by James O’Sullivan, who also is president of the Miracle Mile Residential Association. Susanne Manners, whose family trust owns the building at 1477-79 Havenhurst Drive, which is in Los Angeles and near the project site, filed a similar suit against the City of Los Angeles and against West Hollywood. In its 115 pages, the Manners lawsuit argues a conflict of interests by the City of Los Angeles, given that it is the state’s lead agency in the process for deciding if a project meets guidelines for designation as an Environmental Leadership Design Project (ELDP) and that the Los Angeles City Council is the entity that must ultimately approve or deny the project. As the lead agency, the City of Los Angeles is responsible for documenting the project’s environmental impact and providing a study that offers reasons to support it, a decision which ultimately is made by the governor. The 8150 Sunset project received the ELDP designation in 2014. That designation limits the ability of opponents to challenge the project in court. ELDP regulations stipulate that all legal proceedings, including initial hearings and appeals, can take no more than 270 days. That is an exceptionally short period in the California legal system. The L.A. City Council approved the project on Nov. 1. Susanne Manners alleges a number of errors in L.A.’s evaluation of the project and calls out the fact that its developer, Townscape Partners, has donated hundreds of thousands of dollars to the election campaigns of L.A. City Council members. Manners criticized the L.A. City Council for approving the 8150 project without first considering whether to affirm or deny the L.A. Cultural Heritage Commission’s recommendation that it grant historic landmark status to the Lytton Savings Bank building, which is on the project site and is likely to be demolished or moved to construct the new project. Its decision to consider the historic designation after granting the development application is “a clear cut murder of a cultural monument,” the Manners suit says. Manners also asked that the court block the City of West Hollywood’s plans to have Townscape fund creation of a cul-de-sac on Havenhurst Drive, which is on the eastern border of the 8150 Sunset property. That cul-de-sac would block traffic from the project from heading south on Havenhurst, a residential street in West Hollywood. West Hollywood Mayor Lauren Meister and Stephanie DeWolfe, the city’s community development director, negotiated creation of that cul-de-sac with Townscape at a meeting on Oct. 26 at which the L.A. Planning and Land Use Management Committee endorsed the project. As a result West Hollywood agreed to drop its opposition to the project. “The closure of it would further unreasonably and insanely delay emergency response by the Fire Department and Police,” Manners argued. In her lawsuit, Manners alleged that the West Hollywood City Council violated the state’s Brown Act, which requires open meetings by government bodies, in holding an “emergency” closed meeting to approve the agreement with Townscape negotiated by Meister and DeWolfe. That was reportedly one of several Council closed meetings at which a proposed negotiation with Townscape was discussed. The West Hollywood City Council’s handling of the matter has raised a number of questions among local residents. Given the controversy of the project, which sits on the northern border of West Hollywood, it is unclear why the City Council held its discussions behind closed doors instead of at open council meetings. Such meetings generally are limited to discussion of personnel matters and lawsuits filed against the city. Also, the WeHo Council earlier had secretly formed a “subcommittee” consisting of Meister and Councilmember Lindsey Horvath to negotiate with Townscape and had not revealed that to the public. Also Horvath claims that she was unaware that Meister had negotiated a deal with Townscape until she received a text message about the deal from a member of the L.A. City Council who was present at a meeting where the deal was announced. Finally, while Meister negotiated the settlement with Townscape, she joined Councilmember John D’Amico in voting against it in the closed session. Horvath and Councilmembers John Duran and John Heilman voted in favor of the settlement. Duran and Heilman’s re-election campaigns have received major donations from Townscape Partners and its owners and their families. Both Duran and Heilman also voted in support of Townscape’s controversial 8899 Beverly Blvd. project, in which the City Council agreed to let Townscape more than double the size of a building that already was three times the size permitted for its site under the city’s general plan. EDITOR’S NOTE: An earlier version of his story erred in stating that Susanne Manners’s property at 1477-79 Havenhurst Drive is located within the boundaries of West Hollywood. It sits just outside West Hollywood within the City of Los Angeles. The story has been corrected. THIS IS THE ONE MEGA OVER SIZED PROJECT OUTSIDE THE CITY OF WEST HOLLYWOOD. 1. We may not like it, but it’s not our city and have to rely of what the City of Los Angeles does with their projects. 3. I WANT LAW SUITS FILED FOR WEHO OVERDEVELPMEBT – not seeing the City Council and this blog still blitizing this NON WEHO PROJECT as “our fight”. 4. IF THEY EVERYONE WORKING SO HARD AGAINST THIS ONE IS A REAL ANTI-OVERDEVELOPMENT HONEST PROTESTER – DO IT FOR THE REALLY BIG ONES IN WEST HOLLYWOOD. HOW ABOUT JUST ONE WAY TOO BIG PROJECT IN WEHO THAT THE CITY COUNCIL MAKES PUBLIC APPEARANCES PROTESTING THE OBVIOUS AND NUMEROUS NEGATIVE IMPACT THIS SIZE OF PROJECT WILL CAUSE. 5. WHY NOT THE CITY OFM WEHO DROP THIER LAW SUIT ON THIS PROJECT, AND FILE ONE AGAINST AN EQUALLY OVERSIZD PROJECT IN THE CITY THEY WERE ELECTED TO REPRESENT THE RESIDENTS OF. 1. Lillian Disney thought his design for the Disney Concert Hall downtown for awful, she pulled the money due to ‘uglines’. ==== WOW HOW WRONG SHE AND EVERYONE OF US WHO THOUGHT THE DESIGN ON PAPER WAS AWFUL. IT IS A MASTERPIECE IN ARCHITECTURE. Likewise – HIS OTHER MAJOR PROJECTS – are hard to understand on paper – AND HAVE EACH BECOME UNIQUE NEW MODERN ICONIC ARCHITECTURE. BIlabo – Amazing. There is an enormously tall relatively new Frank Geary Residential IT FINISHED AND BECAME AN EYE CANDY FOR THE MILLIONS OF POOR PEOPLE, AND THE MOST DESIRABLE AND PRESTEGIOUS APARTMENT BUILDING FOR THE PEOPLE MAKING HUNDREDS OF THOUSANDS OF DOLLARS A YEAR TO AFFORD TO LIVE THERE. I GIVE FRANK GEARY’S MONUMENTS OF THE MOST INNOVATIVE CHANGE TO THE NEW ICONIC CHANGES IN MAJOR ARCHITECTURE IN CITIES AROUND THE WORLD. IT MAY NOT LOOK GOOD WHEN DONE – BUT HIS FINSIGHED AND DONE REPUTATION OF NOT MAKING BUILDINGS, BUT LANDMARK ART THAT ARE ALSO FUNCTIONING BUILDINGS OF ALL KINDS: Musuems, Concert Halls, Apartment Buildings. IF IT LOOKS BAD – HIS REPUTATION IS ON THE LINE. HE HAS PROVEN HIS NAME AND BRAND AS THE LEADING WORLD ARCHITECT IN THE WORLD OF THIS GENERATION – AND I AM SURE HE WOULDN”T RISH THAT WITH A BAD DESIGN ON THAT SITE. The traffic spillover from the current 8150 Sunset affects the neighborhood far beyond Havenhurst. The exponential effects will lock down Harper, Laurel and Hayworth as well as Crescent Heights which in turn affect Fountain. Interesting that all the LA approved projects from 8150 east to 8000 and further to the development adjacent to the DGA all have entrances & exits to the side streets with none on Sunset. Neighborhood crushing would be an understatement. And we have only just begun. DEVELOPMENTAL WOES, a mouthful here, “Here is our gift, you should be grateful…..too bad our lack of consideration may bring inordinate problems to your neighborhood and the surrounding area that as are unmitigatable. Even though there may be reasonable solutions we are not interested in finding them so please sue us.” Also, LOUIS, excellent and informative, especially appreciated as a resident on Havenhurst in West Hollywood. The story needs corrections regarding the Manners family lawsuit. Their 1477-79 (not 70) Havenhurst Drive small apartment building is not located in West Hollywood but Los Angeles, three building south of Sunset. (Google map it). The building is not behind 8150 but to the West on the Los Angeles portion of Havenhurst Drive. All emergency services for the Manners building come from Hollywood, not West Hollywood, and would enter Havenhurst Drive from Sunset. As for objecting to the cul-de-sac that would most likely use Delta TT210 bollards (found on Alta Loma and Hammond), they are activated by emergency vehicles and recess to street level, not impeding any access. The major reason for the cul-de-sac is that Townscape (the Angelo, Gordon New York multi-billion dollar hedge fund backing the development) wants full use of Havenhurst Drive. They need this for the planned 5000 diesel truck trips to build the 8150 Sunset development. They also want future access for the 1000s of cars and trucks entering/exiting on Havenhurst Drive after the building is completed. The 8150 Sunset garage entrances/exits (cars and trucks) would be directly across from the Manners building along with the historic Andalusia and WEHO’s Havenhurst Apartment housing. The Manners lawsuit should have demanded the Cities of Los Angeles and West Hollywood deny any use of Havenhurst Drive, except we know that the political hacks deciding all of this have taken thousands of dollars from Townscape for typical “pay to play” campaign donations. What about El Pollo Locco???!!! Hello Michael: The neighborhood above and below 8150 Sunset is desirous of a fresh project. West Hollywood would undoubtedly appreciate a fresh project bordering their city. Townscape arrived with not one but two projects, the Hart Howerton, essentially unsuitable and currently the Gehry design which has its moments but could be refined. By geefully announcing a “Gateway” to the Sunset Strip…..West Hollywood, did WH ask for a gateway, was Townscape interested in any reasonably collaborative ideas? Here is our gift, you should be grateful…..too bad our lack of consideration may bring inordinate problems to your neighborhood and the surrounding area that as are unmitigatable. Even though there may be reasonable solutions we are not interested in finding them so please sue us. The Lytton Savings Bank stands on its own merits as part of the architectural fabric and was never intended as a ploy to thwart the project. 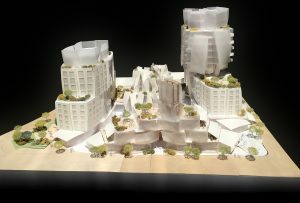 It’s design elements speak to much of Gehry’s sensibilities and could be accommodated in a thoughtful way as required. It has now become Gehry’s “location for the crane” which would normally be on the site of the Havenhurst building. Whatever the ties between council members and Townscape, the only real issue here is whether the Lytton Bank should be saved (which would be nice, but is open to dispute). These lawsuits look like classic nuisance suits (the owner of a neighboring property? Thinking about anything but lost rental income ? I doubt it). Gehry’s project is a huge improvement on the depressing mess at 8150 Sunset, with its dreary acre of asphalt along Sunset. We are talking here about crummy, badly designed mall that despoiled a real landmark, The Garden of Allah. For once, a developer is clearly upgrading a messed-up piece of cityscape. And all we get is knee-jerk BANANA-ism (Build Absolutely Nothing, Anywhere, Not at All). Thanks for connecting the dots; in West Hollywood, all you have to do is follow the money. In 2015 Townscape donated tens of thousands of dollars to an independent expenditure campaign to support the election of John Heilman and Lindsay Horvath. That “independent” campaign was run by Council member John Duran who solicited the cash from developers. Like the “confidential” Ian Owens settlement, the City Attorney is doing his best to insure the this sort of dirty business is kept from the public view. Once again the City Council is being victimized by less than stellar legal representation. It seems dubious that this sort of lawsuit which does not involve personnel matters or where the City is a defendant, that these discussions should be “confidential”. There does not seem to be a logical reason for the negotiate with Townscape in secret except to keep the public in dark about who was supporting Townscape. This is particularly true given that Townscape donated something like $30,000 to the “independent” expenditure campaign put together by Council member John Duran that was for the benefit of Lindsay Horvath and John Heilman, for the 2015 City Council election. Unfortunately when these obscene amounts of money are being raised by the incumbents, it becomes difficult of the public not to believe we have the best City Council money can buy. Sadly, neither side represents the best interest of the city of West Hollywood or Los Angeles. Merely self interests that waste millions while the future of the region remains at a standstill. Meister negotiated the settlement and then voted against it? Something is not kosher there. Of course, Duran and Heilman once again accepting major donations from developers is not news. We have got to get rid of those two on the Council. They are not objective when projects come up in front of the Council.